Jeff Anderson has been organizing bike trains at Wolftrap Elementary School for several years. Wolfie's Bike Train runs several times a year. Jeff has also been instrumental this year in working with FABB, WABA, Trails for Youth and others to encourage Fairfax County Public Schools to get more involved in the Safe Routes to School Program. Jeff Anderson is a parent of three children, all of whom bike to school at Wolftrap Elementary School in Vienna. 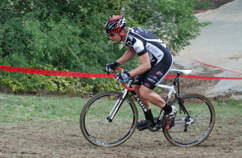 Jeff spearheads the school's Safe Routes to School program, and as his photo shows, is a cyclocross racer in the mid-Atlantic region. How did you get involved in SRTS? It was by accident, really. My wife, kids and I are great bike enthusiasts. So when my oldest child started first grade at Wolftrap Elementary School, biking to school was a given. The only glitch was that the school lacked a bike rack. Two weeks after asking the principal about it, the rack appeared! Shortly after that I started a bike train, comprised mostly of my daughter's friends and some neighborhood kids. The bike train now operates monthly over a nearly 2-mile route. I wasn't totally unaware of SRTS at the time, so I talked with someone at another school about their SRTS program. That got things started for me and now I understand what the states' SRTS program is and how the program can help Wolftrap. I work with the school's PTA to promote SRTS. The PTA is very supportive and is an outlet to the school community about SRTS events and activities. Other than enjoying biking, why is SRTS important to you? I am committed to getting more students to walk and bike to school as a way to reduce the number of cars around the school during arrival and dismissal. All three of my children are at Wolftrap - in 5th, 3rd and 1st grade - so I'm in it for the long haul and believe that by the time my 1st grader leaves Wolftrap, things will be very different. My vision is for 20 or more bikes in the racks most days. We now have two racks, but we'll need a third with that many kids biking to school. And, I would like to see kiss and ride used as a convenience, not as the main mechanism for kids getting to school. This would greatly reduce the 90-100 cars using Wolftrap's Kiss & Ride each school day. Is the school principal supportive? Because principals have a lot of decision-making power, they can often influence decisions parents make about how their kids get to school.Our school principal has been great. She really understands SRTS and supports the program. Most importantly, she trusts parents to do the right thing in setting up and running programs and activities. This is key for SRTS successes at any school. Our principal's support for SRTS comes from her own active lifestyle. She runs marathons and is very visible about promoting health and well-being in the school. She understands the importance of educating the whole child. For example, she didn't object to the bike/walk challenge we held during SOL testing week, joining in our walking and biking to school activities. How do the students feel about SRTS? They love it. They get very excited about the bike and walk challenge, creating meeting points for walking and biking to school. They especially love the comraderie that comes with walking and biking to school together. Unlike the past, this initial socialization happens on the way to school, not in homeroom. Our students' enthusiasm is contagious! School board members, state delegate (Mark Keem), and a couple local professional bike racers have all joined in. Have you applied for infrastructure funds to improve the walking and biking conditions around Wolftrap? No, Wolftrap has good sidewalks around the school. The infrastructure is the easy stuff; county engineers know how to do this. It's the education and encouragement which is harder. So, how have you tackled the need for education and encouragement? We received a $2,000 grant from Prevention Connections and will host our first bike rodeo in April 2012. This is a logical growth of our past work. For example, in 2010 we held a series of events during the May National Bike to Work week, such as a bike education workshop for students and parents, and after school events with the police department. It was the second year of our Bike and Walk Challenge Week, which we have continued since its inception in 2009. I started the Bike and Walk Challenge Week with the goal of creating a friendly competition among classes at Wolftrap Elementary School and other Vienna schools to see which could get more kids to walk or bike. During the week, we challenged parents to not drive their kids to school. We counted kids walking and biking to school, and those arriving by car. As the week progressed, we reached a 50% reduction in the number of students arriving by car and about ½ the kids either walked or biked to school by the end of the week. Who else do you work with on SRTS at the school and in the larger community? I am really proud to say that the entire Wolftrap Community has been involved, including the PTA. PTA members help get out information about our SRTS program and actively participates. For example, PTA members count kids and cars during the challenge week. A couple of parents help - regardless if the temperature is 19 degrees or 90 degrees! What about the school division? Fairfax County Public Schools (FCPS) is really beginning to engage in SRTS. Working with the Fairfax Advocates for Better Bicycling (FABB), Trails for Youth, the Washington Area Bicyclists Association (WABA), FCPS supported International Walk to School Day in October 2011, resulting in 26 schools participating in event activities. Our goal is for 50 schools to participate in the 2012 event. Another sign of their support is a change in the criteria for the division's Golden Wellness Award. Schools apply for the award, ranking themselves in areas such as recycling and student health. In the past, the application didn't provide credit for walking and biking to school. But, we successfully lobbied for a change in the application. Now, walking and biking to school is included in language for the health and well-being awards. In addition, the FCPS School Board recently passed new school policy that puts decision-making about how children get to school firmly in the hands of parents. The policy also adds bicycling education to the existing pedestrian and bus safety education. Marketplace recently did a show on how bike commuting is becoming cool among tech companies: Techies on the cutting edge... of bike commuting (the bike commuting section starts at about 19:00; it should start there automatically). Companies are in a race to outdo each other on bike friendliness. Google not only gives employees racks and lockers, the company will donate to charity if employees ride to work. Etsy's got an in-house bike mechanic. In New York, Foursquare just chose a new location for it's headquarters, based on where biking would be easy. “We can transform communities across the United States and accelerate the creation of a more bicycle-friendly America by combining the programs, resources, and members of these three leading organizations,” said Chris Fortune, Chairman of the Bikes Belong board and member of the transition team empowered to facilitate unification of the three groups. The transition team comprises representatives of each organization and will be working with the boards, staff, and members of each group to implement the process. See the official statement that includes a FAQ. 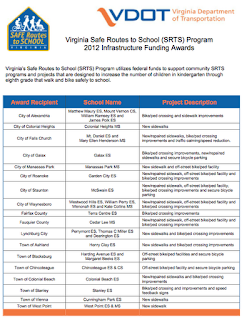 The VDOT Safe Routes to School program recently announced the schools that received funds from the program for 2012. Terra Centre Elementary School is located on Burke Centre Parkway. They received funds for Bike/ped crossing improvements. Cunningham Elementary School in Vienna, located on Park Street, received funds for new sidewalks. Congratulations to both schools and especially to parents whose hard work helped get the applications completed and submitted. Each application requires completion of a School Travel Plan. These take a great deal of work, usually by parents with help from either county or town staff. These plans are required for all grants, those for non-infrastructure funds used for encouragement activities, and for infrastructure funds to build such things as sidewalks, crosswalks, bike lanes, and trails. We're hoping this requirement is eased for non-infrastructure funds in the next round of funding. Safe Routes to School Program funding was removed in the most recent version of the Transportation Bill that passed the House of Representatives. The Senate could vote on it's version of the bill later this week. It's not too late to contact your Senators to ask them to restore SRTS funding as proposed by amendment 1549. We spoke to lots of people today at the Be Fit McLean Outdoor Expo. People wanted to know about good bike routes in the county and we had several copies of the Fairfax Co Bicycle Route Map to hand out. Several people signed up for the FABB e-newsletter (to sign up send a message to info@fabb-bikes.org). We also encouraged people to get involved in the county Bicycle Master Plan process. We met Eduardo from Phoenix Bikes, a youth and community bike shop in Arlington. Their table was covered with free bike bells courtesy of BikeArlington. Phoenix Bikes will be holding a used bike sale on March 3 at Big Bear Cafe in DC. Phoenix is helping the Falls Church High School bike club to hold club rides since bike riding is a prohibited activity and the club needs an outside sponsor to hold rides. We're hoping to change that policy. Supervisor Foust was on hand to check out the exhibits and judge the Dutch oven cooking contest. The National Park Service reps were next to our table and we discussed the issue of biking on the GW Parkway. According to them, the original charter for the GW Parkway states that bikes are not allowed on the Parkway and it was their sense that it would take an act of Congress to change that charter. We learned that NPS holds Learn to Ride classes and Bike with a Ranger sessions in the spring. WABA also has a full schedule of bike classes this spring. We'll post more details on the FABB events page. Thanks to the FABB volunteers who helped out at our booth and to everyone who made donations to support our work. Our next event is the Vienna Green Expo on April 19. We spotted this young lady today in Vienna in her Valentine's dress, a bouquet of red roses and high heels. She said she's been celebrating Valentine's Day by riding in similar outfits all week. It just shows you that sometimes special bike clothing can be high heels and a dress instead of spandex. FABB has been working with the Vienna Bicycle Advisory Committee to help get better bike parking for residents and visitors to the Town of Vienna. Thanks to a generous grant from the Transurban-Fluor Community Grant program we were able to purchase and have installed 3 inverted U racks at Red Mango frozen yogurt and Maple Ave Market. The Vienna BAC developed a streamlined application form for businesses that wanted to install bike parking. They worked with the Town Council to get the form approved and then helped the two stores fill out the applications. The racks were installed today. The racks at Red Mango are in front of the store and are mostly visible from inside. There is almost no concrete or asphalt space for the racks so they were installed in concrete in the grassy area. Mulch will eventually be put down to keep the area under the racks from getting muddy. Behind Maple Ave Market there is one inverted U rack also installed in concrete in a parking space that is currently unusable. The rack is very close to the edge of the asphalt so that the area behind the store can be used for loading and unloading. The items to the right of the rack will be moved and mulch will likely be used where there is no asphalt. Thanks to both of these bike-friendly shops for providing bike parking for their customers. We suggest that you check them out and at the same time purchase some of the tasty frozen yogurt at Red Mango (serve yourself and then pay by the ounce), and the fresh produce and other goodies at Maple Ave Market. Thanks also to the hard-working folks at the Vienna BAC. They are currently working with other businesses in the Town to get more bike parking installed. Maple Ave Shopping Center recently applied for permission to install 11 inverted U racks, which should be in place by this spring. FABB will have a table at the Be Fit McLean Outdoor Expo at the McLean Community Center, 1234 Ingleside Ave. on Saturday from 10-4pm. We'll have county bike maps, safety brochures and other literature. There was a great crowd at last year's expo. Many commercial and non-profit outdoor groups will be there and there should be lots of free handouts. DeBoard comes to the town from the Fairfax County department. She currently is a deputy chief for Investigations and Operations Support. Prior positions in which DeBoard served include commander of the county’s helicopter division, commander of the special operations division, captain of the Franconia district station and major of the division II patrol bureau. DeBoard began her career with the county in 1986 as a patrol officer. As president of the Fairfax-based Police Unity Tour, a nonprofit dedicated to raising awareness of law enforcement officers killed in the line of duty, she actively is involved in fundraising for the National Law Enforcement Officers Memorial Fund in Washington, D.C. The four-day fundraising Tour starts in New Jersey on May 9 and ends in DC on May 12. Last night cyclists from the Annandale and Falls Church area gathered at the Mason District office to hear about the countywide bicycle master plan. After a presentation by Bob Patten of Toole Design Group, cyclists marked up detailed maps of the area to highlight existing routes, popular destinations, and barriers to travel. This was the sixth of eight meetings focused on different parts of the county. The Annandale-Falls Church bike plan area is located inside the Beltway south of I-66. There are several major barriers to bike travel: I-66 in the north, the Beltway, I-395, and Lake Barcroft. The bridges over the Beltway are being rebuilt as part of the HOT lanes project and many will have bicycle facilities, the roads leading to those bridges have few if any bike accommodations. There was discussion of the lack of trail maintenance and the problem of identifying which agency or group is responsible for local trails. VDOT does maintain some paved trails in their right of way but the County is responsible for most, and there is almost no money available for repaving or repair. One way to find out who should maintain a specific trail you can contact the bike program office. During the discussion, the VDOT NoVa district Bicycle and Pedestrian Coordinator Cindy Engelhart noted that the new VDOT snow map shows the location of all VDOT maintained roads. This is an interesting interactive mapping tool used to show the plowing status of all roads in Fairfax County that are maintained by VDOT. 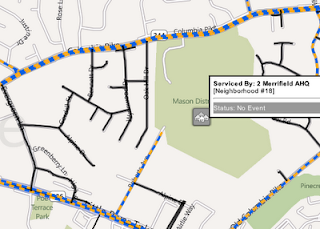 By hovering over the neighborhood icon all streets maintained by VDOT are highlighted according to their plowing status: Plowed, In Progress, Not Started (or No Event in black). Those streets not highlighted are maintained by others, either the county or homeowner associations. An interesting statistic mentioned during the briefing is that most commuting trips (92,000) are greater than 3 miles in length (87%) but 34% of all other trips (272,000) are less than 3 miles, trips that with good bike facilities can easily be made by bike. The Annandale area is not flat and one cyclist suggested showing elevation on bike route maps which can be valuable information for cyclists planning a trip. Currently Google Map bike directions does factor in elevation when calculating routes. To see notes and information from the other bike plan meetings visit the bike plan Materials & Resources page. After the bike plan meeting we held the monthly FABB meeting. One of our goals this year is to move the meeting location to different parts of the county. This was a good opportunity to do that, participate in the bike plan meeting, and meet some new cyclists. County bike coordinator Charlie Strunk reported that the contract for building bike lanes on Gallows Road from the W&OD trail north into Tysons to Old Courthouse Road was awarded. The project will be completed this year. The county bike route map is being updated and a draft of the map is currently being reviewed. Printed copies should be available by Bike to Work Day on May 18. FABB member Douglas Stewart passed around a report assessing various bike routes between GMU and the Vienna Metro station. The next step is to work with the City of Fairfax to sign the route and make any needed improvements. FABB is now a RoadID affiliate. If you visit the FABB homepage and click on the RoadID icon (or click on the icon on the left), 10% of any RoadID products you purchase within 60 days will be donated to FABB. We also have a new rack card. Thanks to TYTRAN, the Tysons transportation group with whom we're coordinating the Tysons Bike Group meetings, for helping us with the printing costs of the card. 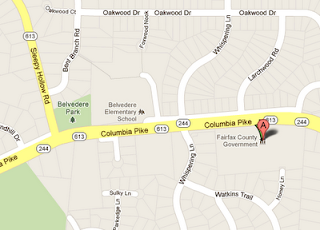 This month FABB will move our monthly meeting to coincide with the Annandale Bike Plan Meeting. Both meetings will be held tomorrow, Wed. Feb. 15 at the Mason District Governmental Center, 6507 Columbia Pike, Annandale. The bike plan meeting is an open house that begins at 4:30 p.m. There will be a presentation at 6:00 p.m. The event is scheduled to end at 8:00 p.m. The FABB meeting will start at 7:30 p.m. in an adjacent room. Everyone is welcome to attend both meetings. This is a good opportunity for cyclists to let the bike planners know where you ride, where you can't ride because of obstacles, and what the county can do to make the Annandale area more bike-freindly. There are many people who get around by bikes in this area. Many are service workers who rely on bikes for transportation. All cyclists in the area need better on- and off-road bike facilities, including adequate bike parking. School kids need safe ways to ride their bikes to school and places to park when they get there. They also need bike safety education classes. Let your voice be heard by attending this important meeting. 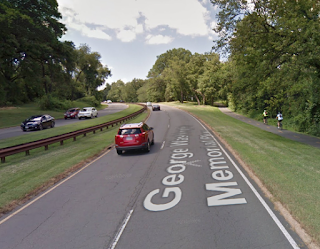 At this week's meeting of the Mt Vernon Council of Citizens' Associations Transportation Committee reps from the National Park Service and the US Park Police discussed safety issues related to the George Washington Memorial Parkway. Bicycling has been banned on the Parkway since at least 2006 "in the name of safety." It's odd that bicyclists are banned from riding on the road since we are allowed to ride on almost all other roads in Virginia, many of which I would consider more dangerous than the Parkway. Numerous complaints about increased traffic in BOTH directions of the Parkway during rush hour with BRAC and the new hospital at Ft Belvoir cited as the cause. Excessive speeding by traffic was also mentioned. Because of the traffic, it's very difficult for drivers to turn out onto the Parkway during rush hour, especially for those turning left. Nevermind the issues that cyclists and pedestrians face trying to cross the Parkway. On that note, NPS has no current plans to improve bike/ped access to the MVT, though they had considered intersection improvements at Belle Haven Rd at one point. This is problematic since, between the south end of Old Town and the "Stone Bridge" at Alexandria Ave (a little over 3 miles), there is no way for bikes and peds to access the Mount Vernon Trail that doesn't involve hopping a curb and going through grass. The current (acting) NPS Superintendent has no intention of lifting the GW Parkway bicycle ban. The NPS reiterated that the current policy ban was put into place "in the name of safety". When asked about MVT improvements, the rep said that NPS is looking into an "express bike lane" in the Gravelly Point area. This would allow through cyclists to avoid the heavy congregation of pedestrians just east of the parking lot that go there to watch airplanes take off and land at National Airport. US Park Police apparently have data on accidents/crashes that occur on the Mount Vernon Trail proper. They're looking into making that data available to members of the transportation committee. NPS has automated traffic counters at several locations along the parkway and postsaggregate monthly stats on them. The committee asked if they also have hourly counts, which they'll look into. The hourly counts would give a better idea on when the low-traffic times are on the Parkway. The Committee is also considering support for a resolution to allow bicyclists on the Parkway during certain times. The draft resolution will be discussed at their next meeting on Monday, March 5 at 7:30pm at Whitman Middle School library. Ask the Senate to Support Cardin-Cochran, Tell Your Representative to Oppose the House Bill It’s time to ask both chambers of Congress to save our streets. Will you contact your Representative and Senators today and ask them to save our streets? Local governments deserve a voice in transportation. The Cardin-Cochran amendment ensures that cities and counties have a voice in making transportation decisions for safer streets in their communities. Safety matters. Bicycle and pedestrian deaths make up 14% of all traffic fatalities, but only 1.5% of federal funds go towards making walking and biking safer. These programs provide funding for sidewalks, crosswalks, and bikeways that make streets safe for all users. HR 7 makes streets more dangerous for kids. By repealing the successful and effective Safe Routes to School program, the House bill makes the streets more dangerous for kids on their walks and bike rides to school. Congress needs to know that that finding effective, efficient transportation solutions to keep people safe on the streets should be a national priority. Please contact your representative and senators today. Thank you for all that you do to keep the streets safe! Please visit the Take Action page. With the success of Capital Bikeshare, many communities and organizations are looking at the feasibility of using bike sharing for short trips. Ideally new bike share stations would be integrated into a larger system. However, even in some suburban communities independent bike sharing systems could work if there is a critical mass of users, bikes, and stations. The installation is working with MetroBike, a bike-sharing consultant company, on an initiative that would create a network of cycles for people to use as transportation to various locations on post such as offices and eateries. "The long-term goal is to have stations spread out about five minutes apart from each location," said Juanita Green, garrison transportation demand management coordinator. No start date is set for this initiative but Green expects Belvoir to have the transportation method in the near future. According to Paul DeMaio, founder and managing member of MetroBike, bike-sharing is a short term transit rental service. 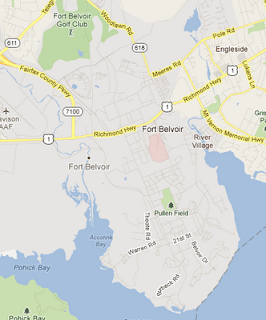 According to Green, Fort Belvoir, which is significantly smaller than D.C. and Arlington, would likely have a scaled down version of the Capital Bikeshare network. Green said the garrison’s system would have docks close to offices, businesses and recreational locations for employees and residents. The transportation method could help mass transit commuters travel to meetings, lunch and shuttle pick-ups throughout the work day. Biking could also be an alternative for community members traveling to places on post such as fitness centers and convenience stores. Green expects Belvoir to start the program slow with stations potentially located at 12th Street, Fort Belvoir Community Hospital and the 300 area. The ultimate number of bicycles and docks would depend on funding and demand. "I would like to see it all through the installation as a means of transportation for employees," Green said. "A lot of them using mass transit don’t have means internally to travel around post." The transit method could have a number of long-term benefits to the installation. Bike-sharing would reduce the number of vehicles on the road which reduces congestion, accidents and car emissions. Daily ridership is also a form of exercise. "It’s introducing bicycling to people who haven’t been on a bike since they were a child," DeMaio said of bike-sharing’s popularity in other areas of the country. The garrison’s next step is to acquire assistance from directorate and tenant organizations on post for funding and maintenance support of any future network of bikes. VDOT has created a series of maps showing Bicycle Level of Service for major roads in Virginia. 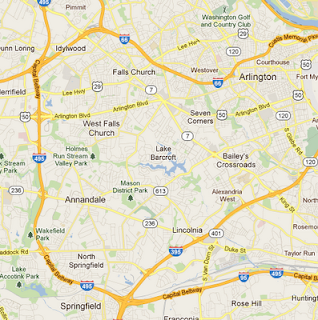 The area on the right shows the Dunn Loring/Merrifield area of Fairfax County. 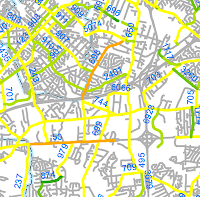 It shows the problem we face; there are a few bike-friendly roads (in green) that mostly don't connect. The roads that do connect are level D or E that only experienced cyclists are willing to use. Thanks to TheWashCycle for pointing out these maps. Four young women are riding bikes cross country from Florida to San Francisco to raise money for the League of American Bicyclists Bicycle Friendly Communities program and for the Safe Routes to School National Partnership. Organizer of the ride Jeanie Ward-Waller currently lives in DC. The group leaves Key West on Saturday, Feb. 4. You can follow their progress on the Ride American for Safe Routes website. It's a cruel irony that the U. S. House Transportation and Infrastructure Committee is voting today on a Transportation Bill that would cut most funding for bicycling and pedestrian projects, including the Safe Routes to School Program. A public meeting on "multimodal improvements that will address existing and future transportation needs in the Interstate 66 corridor from U.S. Route 15 in Prince William County to Interstate 495 in Fairfax County" is scheduled for tonight, Feb. 2 from 5-8 p.m. at VDOT NoVa Headquarters, 4975 Alliance Drive, Fairfax, VA 22030. This is just south of I-66 off West Ox Road. Cyclists are encouraged to attend the meeting and speak out for bike access along the I-66 corridor. We need a major trail along I-66 similar to the Custis Trail. Bicyclists also need to be able to safely cross I-66, which forms a major east-west barrier in many areas of western Fairfax Co. Please either attend the I-66 meeting or email comments to the study team's leadership (reference "I-66 Tier 1 EIS: Public Comments" in your subject line) at CG.Collins@VDOT.Virginia.gov or Stephen.C.Walter@Parsons.com. 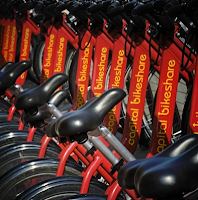 Today's Post has a long article about the expansion of Capital Bikeshare in Rockville and Alexandria: Capital Bikeshare program looks to spread into the Washington suburbs. A key reason the bike program has flourished in the District and Arlington has been the expansion of bike lanes and bike-related improvements to encourage cycling. 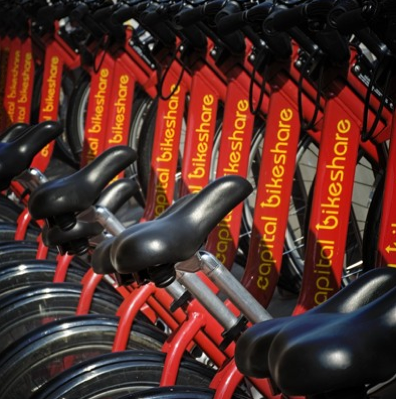 As Bikeshare moves to areas outside the city, the same accommodations are important, said Shane Farthing, director of the Washington Area Bicyclist Association. “I do think that the next places that come along are going to have to step it up a little bit to make sure that conditions are right, that people are safe, that there’s space for people to bike, and that drivers and cyclists are educated on how to ride responsibly,” Farthing said. In 2010 Fairfax County applied for funding through the TIGER II grant program for bike sharing in either Reston or Tysons as part of the MWCOG application. Their application was not among those selected for funding. While Reston is becoming more bike-friendly, that community and most of Fairfax still have a long way to go before most bicyclists feel comfortable riding on most of our roads. We will definitely have to "step it up a little bit" with more bike lanes and calmer streets before bike sharing becomes feasible. Tysons is undergoing a major transformation and within a few years could be ready for bike sharing. Moments ago, Congressman John Mica (R-FL) announced the introduction of the American Energy and Infrastructure Jobs Act. The proposed bill eliminates dedicated funding for bicycling and walking as we feared, and it goes much further and systematically removes bicycling from the Federal transportation program. It basically eliminates our status and standing in the planning and design of our transportation system -- a massive step backwards for individuals, communities and our nation. It's a step back to a 1950s highway- and auto-only program that makes no sense in the 21st century. eliminating language that insures that rumble strips "do not adversely affect the safety or mobility of bicyclists, pedestrians or the disabled." The House Transportation and Infrastructure Committee will vote on the bill on Thursday. Representatives Petri (R-WI) and Johnson (R-IL) will sponsor an amendment that restores dedicated funding for Transportation Enhancements and Safe Routes to School. There are no Virginia representatives on the T&I Committee. However, you can take action. See the LAB Advocacy page for suggested next steps.